Eureka Springs, Ark., offers large and small wedding venues. You’ll find lots of beautiful places to celebrate your big day in Eureka Springs, Arkansas. This beautiful Southern town offers something to suit almost any taste from gorgeous historic hotels to picturesque outdoor landscapes. Many locations offer a variety of wedding packages for you to tailor it to fit your needs. Hidden Acres is the place to have your wedding if you’re looking for a smaller, more intimate ceremony. You can invite up to 12 guests to an indoor or outdoor ceremony in Hidden Acres’ chapel or gazebo. The owner of Hidden Acres, Photography By Charles, has more than 30 years of experience and can provide photography for you and your guests. Other things you need for your wedding also are available through Hidden Acres, including an ordained non-denominational minister, wedding cakes, complimentary toasting beverages, bouquets and music. A video of the ceremony is provided for you to remember your big day. If you or your guests choose to stay in the cottages, each one comes equipped with personal hot tubs and fireplaces for a romantic weekend. This location also is good for intimate ceremonies with up to four guests. Eureka Springs Treehouses offer a variety of wedding packages. The Ultimate Wedding Package includes ceremony, pictures, a carriage ride with champagne and snacks, a picnic supper and a Romance Package of rose petals and candles. Daytime wedding locations include the treehouse deck or water fall. The Oak Crest Chapel and Oak Crest Outdoor Wedding Pavilion can accommodate both day and evening weddings. This beautiful four-acre estate offers several indoor and outdoor settings for your wedding. Choose to get married in the garden by the fountain, in the quaint gazebo or on the front porch of the Colonial-style home. Ceremonies inside the home can accommodate up to 40 people, while suite weddings offer smaller ceremonies with up to 20 guests. Included are linens in your wedding colors topped with a lace tablecloth, crystal plates, champagne glasses, punch bowl and cups, silverware, candles, napkins and seating. The Gavioli Chapel, built in 1901, has partnered with the 1886 Crescent Hotel and Spa and 1905 Basin Park Hotel. These historic hotels were named after the years they were built. Eureka Springs Weddings will assist you in planning your wedding and offers a variety of wedding packages that include champagne, keepsakes, refreshments and a wedding officiate. 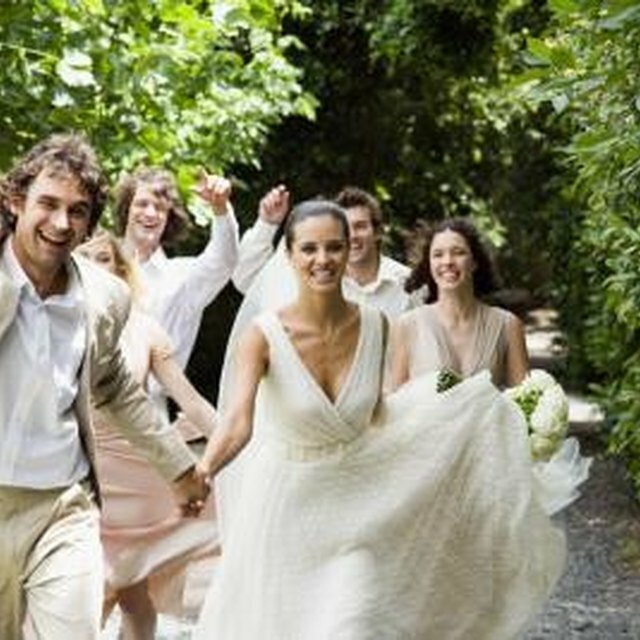 Most wedding packages can accommodate between 25 and 75 guests. Each hotel features a spa for you to relax in before the wedding.